SING&SEE is designed to meet the needs of singers and teachers working in all vocal styles and genres. It gives an almost instant visual representation of the singing voice, allowing singers to see the acoustic characteristics of their voice while they sing, and then to listen to it being replayed - again seeing it directly on the screen. 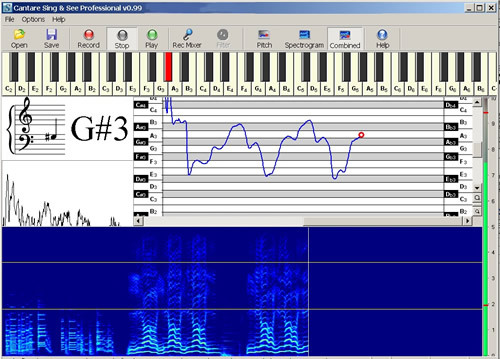 For individual singers, the software can be used as an aid in practice - showing you how you are maintaining pitch, volume, or vocal colour. 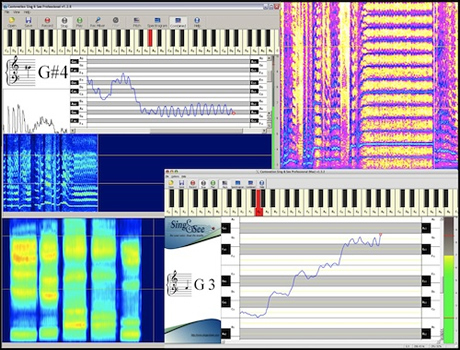 For teaching, the software can be used to illustrate aspects of your students' vocal production, as part of your normal lesson. It can also be used as a practice aid, to allow students to spend time on their own practising a particular exercise that you set. We have developed a Student Version with a simplified display, specially for this purpose. Some teachers are also using SING&SEE as a way to help focus attention during warmup exercises. Indeed, there are probably as many different ways of using Sing & See as there are individual approaches to teaching singing. A few pointers to getting started are given here. "I don’t see why every singer doesn’t use this tool. As a singer, you hear (or should hear) the music and pitches in your head as you vocalize a song. And this comes from remembering the music and the pitches. If you’re singing off pitch, you’re remembering, for recall, off pitch notes. I think any singer who is serious about their craft should definitely use this tool as part of their daily exercises to improve their pitch accuracy, and to help them better distinguish, pitch wise, between a sharp, flat and natural note." "Sing and See is also extremely useful at helping you negotiate your passagio, or vocal break. "